Dr.Molly Joseph was born in 1956 as the daughter of teacher parents, the late M. M. Joseph and the late Annamma Joseph in the serene village of Kongorpilly, Kerala. She grew up among three brothers, got married to Mr.Xavier Gregory, and has a happy family, son Greg Xavier (wife Meera, son Noah) and daughter Sneha Xavier (husband Binil, son Aiden). Dr.Molly Joseph, ( M.A., M.Phil., PGDTE, EFLU, Hyderabad) had her Doctorate in Post War American Poetry. 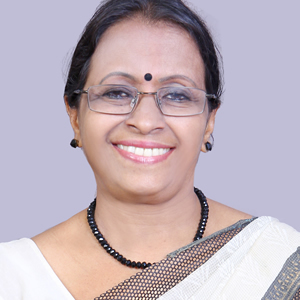 She retired as the H.O.D., Department of English, St.Xavier's College, Aluva, Kerala, and now works as Professor, Communicative English at FISAT, Kerala. She has thirty eight years of teaching experience and serves as Teacher Trainer, Recruiter, and Subject Expert. She is a reputed Orator and Social Activist working for the less privileged. She writes travelogues, poems and short stories. She has published four books of poems - Aching Melodies, December Dews, Autumn Leaves and Myna's Musings. She is a Bilingual Poet, and writes in Malayalam and English. She is a poet columnist in Spill Words, the international Online Journal. She has been awarded Kala Prathibha by Chithrasala Film Society, Kerala and Prathibha Puraskaram by Aksharasthree, Malayalam group of poets, Kerala in 2018 . Dr.Molly Joseph has been conferred Poiesis Award of Honour as one of the International Juries in the international award ceremonies conducted by Poiesis Online.com at Banglore, Karnataka, India, on May 20th, 2018. .